Dalziel Rugby Club players will attempt to make history against Greenock this Saturday by winning the club’s first West Regional Shield final. Despite struggling at the foot of Tennent’s West Division 1 with just one win from their opening 11 games, Dalziel have beaten Wigtownshire, Oban and Kilmarnock to reach the showpiece at Scotstoun Stadium. Dalziel Rugby Club squad members are pictured after their 19-10 West Regional Shield second round win at Oban on September 29. A busload of around 50 Dalziel fans will be cheering on the team in this Saturdays final against fellow West Division 1 outfit Greenock Wanderers. 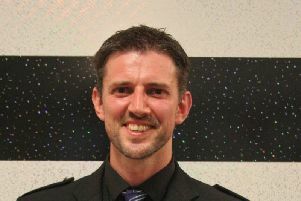 The Motherwell side’s player/head coach Graham Calder (37) told the Times and Speaker: “Greenock are a good team. But with the right team on the park I do believe we can go toe to toe with them and beat them. “Irrespective of our league form, nobody has questioned the boys’ self belief. “The boys believe in their ability and it has gone our way in the cup. 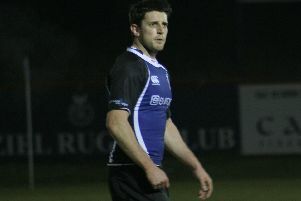 Scrum half Graham, who first joined Dalziel Rugby Club at the age of four, rates Ryan Burrell, Andrew Glover and Alan Bowles as being three key players if they are to win on Saturday, over a decade since the club’s runners-up finish in the 2007-2008 Scottish Bowl. All three stars came through the Dalziel youth system, which Graham believes is “huge” in the club’s success. “We pride ourselves on the fact that so many boys playing on Saturday have come through the youth system,” the head coach added. Graham, who also played for Currie and Stirling during his career, this summer won Dalziel’s Austin Memorial Award (pictured on back page) for his significant contribution to the club including playing, coaching and organising Dalziel’s annual youth rugby festival. The festival, which is now in its 28th year, was previously organised by Graham’s late dad Alan, a former Dalziel captain and club president who died in 2008.